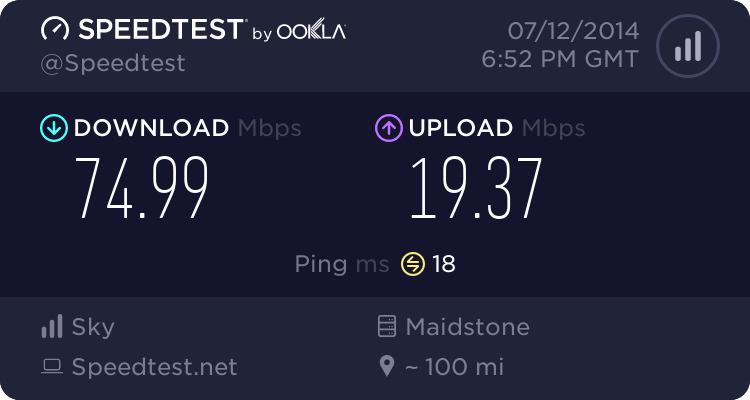 I am moving house in Stevenage, which has access to both Virgin Media Cable broadband, and FTTC services (aswell as traditional ADSL). The FTTC speeds promised by FTTC providers are around 72mbps. Wiith cable, the promised speeds are up to 152mbps depending on the package you buy. I am currently with Virgin media on 120mbps broadband, and find that at peak times the average speed for downloading a large file is about 16mbps. The download rate at times can go down to 100kbps or so. Only late at night/early morning do the speeds consistently reach 120mbps. Cable broadband from Virgin Media at 100mbps ends up being about £5-£10 more expensive per month than the "up to" 76mbps from Fibre providers. My question is which is likely to give me better available bandwidth at peak times? I believe Virgin media oversell their speeds quite a bit (as can be seen from my test). my girlfriend has Virgin cable, and I see that fluctuates wildly speed wise. I sync around 72 meg, and can pull 64/65 meg all day long on FTTC. That'll do it for me. With VM every street is different. Some can be congested others may not be. With BT/FTTC it is the line that is important, i.e. loss and therefore the connection speed. It is far less likely that FTTC will be oversubscribed... partly due to not being available for a long. Heavy users would have signed up to VM (where available) before FTTC became available and have not yet switched through choice or contract. Also the upload on FTTC is impressive ... ~20Mbps! Lowest speedtest reported by my samknows white box last month was 60.83Mps and average was 73.65Mbps. I'm on Sky Fibre Pro. I was on VM for over 10 years (when it was also telewest) but the network went to sh!t over the last 3 years to the point a youtube video would not load. I moved to FTTC and I get 75/18 at around 200m from the cab. I`m happy with BT, no caps but there customer services are pants. I hate VM so much after all this [censored] that I moved to sky for tv and bt for internet and phone. The main problem I find with VM is when a cab goes down all of the services get wiped out(and they go down a lot around here). the other situation i find is that during long power outages the bt line stays up longer than the vm feed did and the sky feed is rained from the sky so I can power my units and still enjoy TV and BB for some time. EDIT I have not yet tried to use backup power on a FTTC line and in my mind it would not work due to the fiber node being so local and on the local power grid as the cabs don`t look fat enough to house a UPS but i could be wrong. All I would say is do some research and see if a FTTC line will work for you, there is loads of info on this site on how to research the info and don`t just speculate that it will all be fine. My mother gets better speeds on ASDL than she would on fiber due to the cab distance and line condition. FTTC is so much better for me than VM but if I could only get ADSL then I would put up with VM. I currently have both but my FTTC is getting slower and slower so I am dumping it in favour of another VM line. I am lucky my area seems very little slowdown although I don't cain it however I do run them both together bonded so it's shared amongst them. It does depend on the area. I could pull 74mbps all day every day and now I can pull 46 in another area. edit.. I started off on 53mbps and this is what I get not 3 months in - hence why FTTC in my area is a waste of time. Yeah I would very much doubt they would go around changing deep cycle batteries unless the line is for a critical reason use. Andrew do you have any inside information on the cab hardware (i.e the size of the batteries used (Amp hours (and inverters if any))). Both services in the same premises? If so, your chances of getting a second VM are slim if not impossible. On the FTTC front, moving away from PlusNet and a change of router might possibly see improved speeds but in any event you won't be getting anywhere near the up speed enjoyed at present using FTTC with a move to VM.